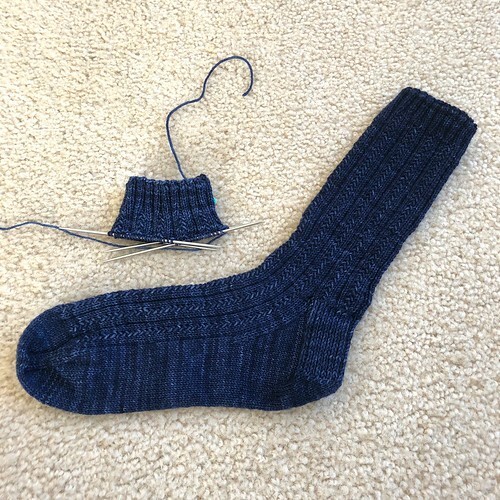 When I finished Mickael's Simple Skyp socks, I cast on for my third pair of socks for the ESK Q2 KAL. 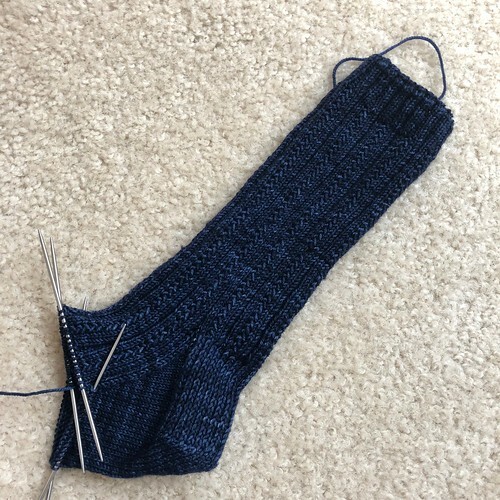 I've already got the first sock finished and I've started the second sock! These are the Eternal Spring socks knit in Sweet Georgia Yarns Tough Love Sock in Sea Spray. This is the same yarn base I used for my Smaug socks in April and I still love it. This is the first time I've knit this pattern but I really like it. The finished sock definitely could use a blocking, but the stitch pattern is pretty but easy to knit as well. 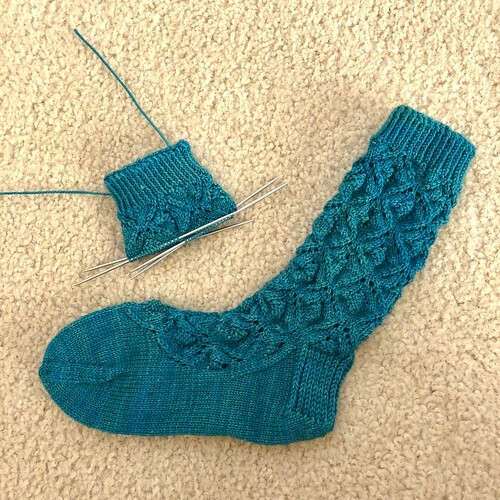 Ink Skyp Socks - Finished! I finished Mickael's socks. These are the Simple Skyp socks that I upsized for Mickael, knit in Madelinetosh Twist Light in Ink. 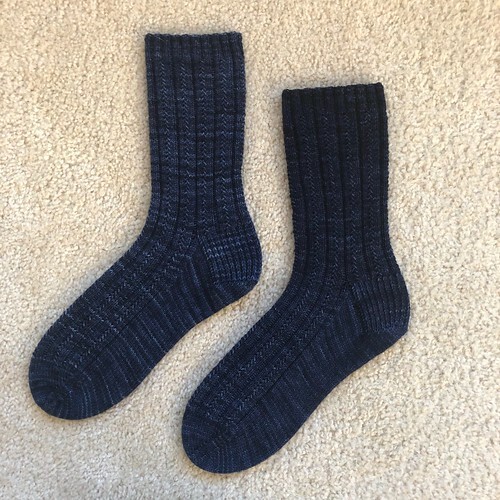 I bought two skeins of this because Mickael's socks have always dipped into a second skein, but since I'm attempting to knit a better fitting sock for him (I noticed this winter that the feet of his socks are loose and floppy), I actually knit this pair with only one skein! I barely made it, but these only took one skein. Also, I know they'll fit because I made him try them on when I checked them for length for toe decreases and they fit. This means I have another skein of Twist Light in Ink! I can make myself a pair of Ink socks now. ...of the heel that is. I'm knitting my way down the foot of Mickael's second sock. The second one always goes so much faster than the first because I know exactly how many rounds I need to knit. Some people work with measurements but my socks knitting revolves around the round counter. 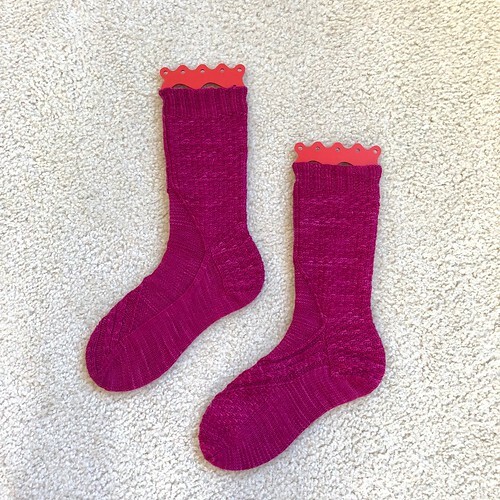 These socks are also a great illustration of the variation of hand dyed yarns. Both socks are being knit from the same skein of yarn (Madelinetosh Twist Light in Ink), but the end of the skein I started with on the first sock was dark. It's gotten lighter as I worked my way through the skein. The pattern is more visible on the second, lighter sock but that's the fun part of hand dyed yarns. That's also why I alternate skeins on larger projects, even if I can't tell that there's any difference between skeins. I've finished the first Skyp sock for Mickael and started the second one. When I made him try it on to see where I should begin toe decreases, he commented that I should probably have his foot measurements written down somewhere. I might. I might not. I have no idea and I have no idea where I would have written them if I did. I should probably add notes to the project page in Ravelry. Then I'll be able to find them later (maybe). When you're a knitter, you get to have all sorts of interesting conversations. This morning Mickael was trying to tell me what he wanted from the grocery store and I replied, "Give me a minute, I'm trying to photograph my tentacles." He ended up being confused and slightly terrified. Knitting is fun. I have three tentacles now! I finally sat down and started the first sleeve on my Il Grande Favorito pullover. Before I did that though, I knit the neckband (and wove in the ends). I'm having to use Magic Loop for the sleeves because I don't have 9 inch circulars (my usual choice for sleeves) or double points in this size. It's been a while since I've used Magic Loop so it's definitely taking a little getting used to again. I've only worked five rounds of sleeve so far. The big, squishy yarn and colors are still amusing me! The cowl is bigger. I keep knitting on it and it eventually gets a little bit bigger. 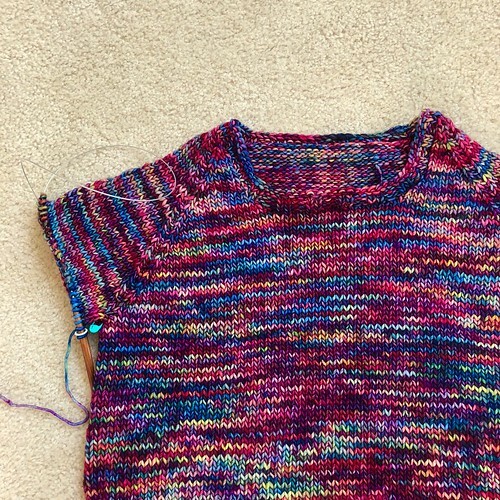 It is a very peaceful knit once I settle into the rhythm of it and I love projects like that. I'm not really caring how long it takes (it's not like I'll need a cowl around here for at least six months), I'll just keep knitting! If I didn't mention it before, you can see that I didn't bother reskeining and washing the yarn after I frogged it. With my arm situation, I don't need to be adding extra arm movements if I can avoid it. I'll wash and block the finished cowl. I've made it past the heel turn and the gusset of the first Simple Skyp sock for Mickael. It feels good to be back on double points again. I'm just more comfortable with them for socks than anything else I've tried. 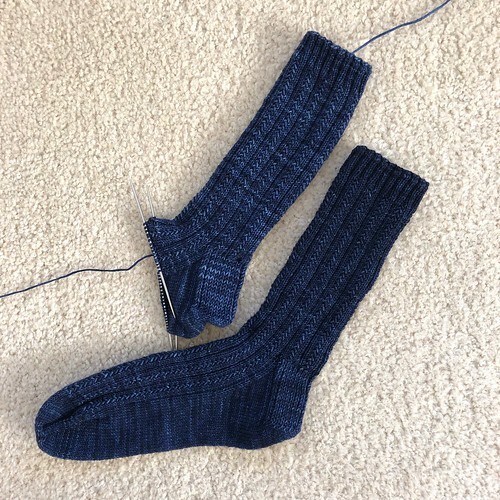 In a few more inches, I'll have to get Mickael to try to them because I can't remember how many rounds to put the feet of his socks before I start the toe decreases. I've got a little ways to go before I get to that point though! Over the weekend I made a tentacle. Just one for now, but there will be more. When I started making the Palpitations hearts earlier this year, I realized that most of my sock yarn leftovers were not exactly "heart" colors. One thing I noticed is that I have lots of greens and blue greens in my leftovers bag. Then I remembered the Gripping pattern. 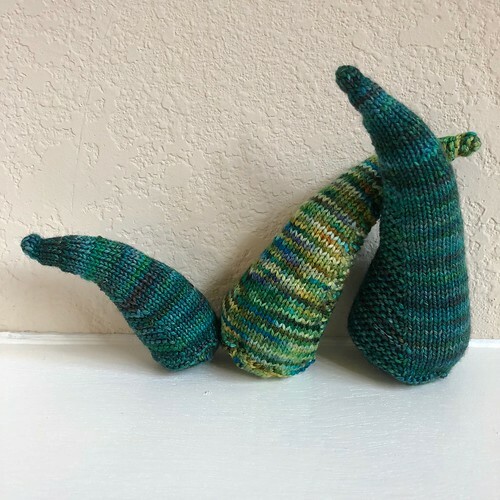 It's a free pattern and let's face it, the look on your teenage boy's face when he asks you what you're knitting and you answer, "A Tentacle" is priceless. This one is made following the directions exactly but when I stuffed it at the end, I put a magnet in the very bottom of it. I don't know if I'll add magnets to all my tentacles or not, but some of them will definitely get magnets. The directions give variations for longer or shorter or thinner or fatter tentacles. I think a good variety of shapes and sizes is the way to go here. At the moment crochet is hurting my arm, so the Grannie Goes Large Blanket is on hold. I wanted to work on something other than the sock and my Aniversario pullover (which is only waiting for sleeves, but I'll have to Magic Loop them and I'm putting it off). So I decided to cast on for another project. 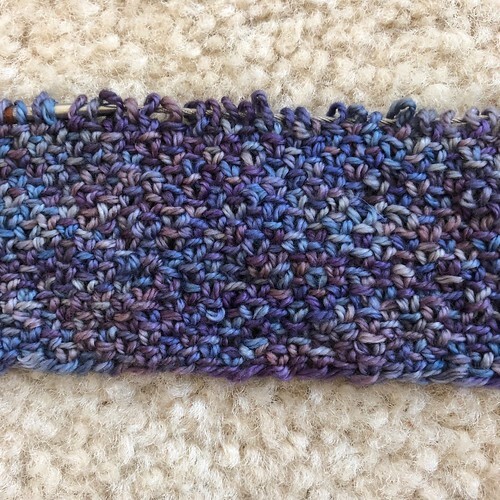 Back in 2014 I knit a cowl/poncho type thing, but I didn't alternate skeins. When the first skein ended and the second skein began, there was a definite color shift because the second skein was darker than the first. I thought I could ignore it. I couldn't. I would put it on, try to wear it, and before I'd make it out the door, I had taken it off. The color shift was just not working for me. Earlier this week, I frogged it and I've started a new cowl, and this time I'm alternating skeins. 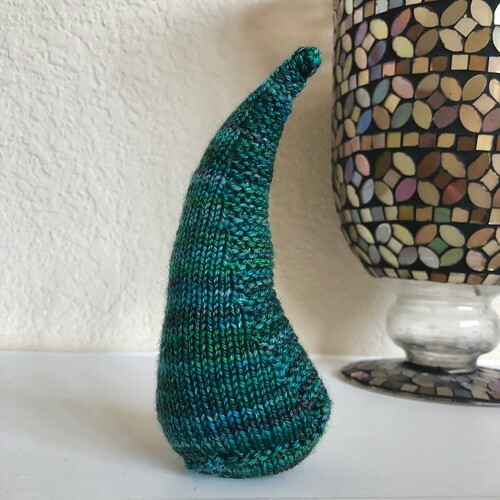 The yarn is Dream in Color Smooshy With Cashmere in Rock The Olive. The pattern is Jessica Jones. It's all linen stitch. It's OK though. I've knit linen stitch before so I know what I'm signing up for. I think it will be perfect in this yarn and I have another skein, so when I finish the cowl, I will be able to make a pair of fingerless mitts. I'll have a matching set! How often does that happen? I cast on for a new pair of socks and I've knit the leg and am ready to begin the heel flap! 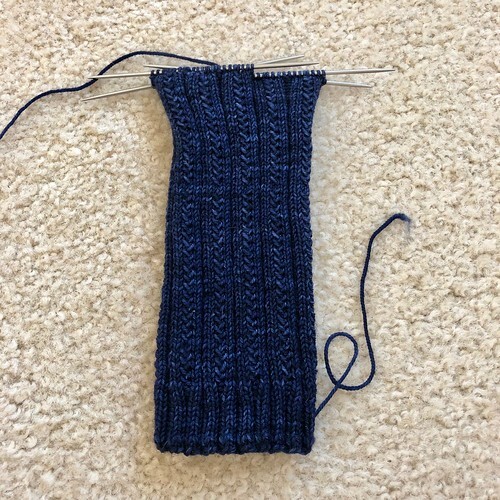 These are the Simple Skyp Socks and I'm knitting them in Madelinetosh Twist Light in Ink. Since I'm knitting them for Mickael, I've sized them up a bit and I'm working 10 repeats around the leg. I'm going to change the stitch count for the foot because I've noticed that his hand knit socks are a bit floppy on his feet, so this pair is a bit of an experiment. I'm also back on regular double pointed needles for these and it just feels so much better. Later today I might cast on something else new! I have finished my Smaug socks! 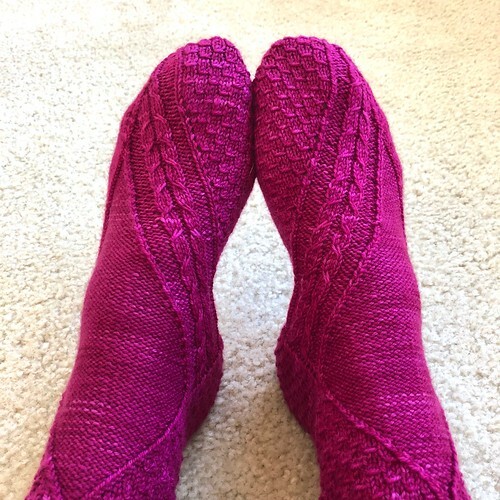 The pattern was Smaug Socks and I knit them in Sweet Georgia Yarns Tough Love Sock in Lollipop. 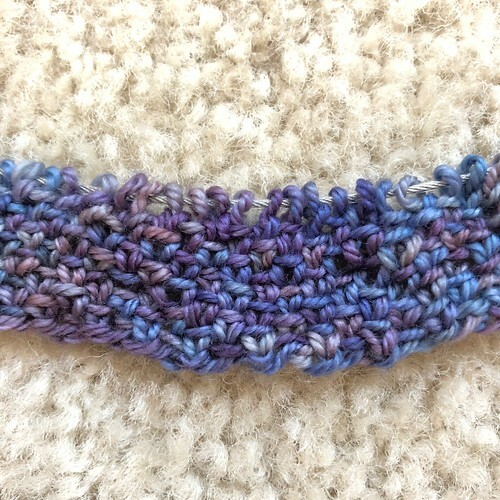 This was my first time using this yarn and I really like it (which is good since I have several more skeins). This was also my first time using the Addi Flexi Flips needles. I know a lot of people really like these, but they didn't really work for me. It probably has something to do with the way I hold my needles, but they just never felt comfortable in my hands. I also found that my gauge was looser on these than on double points. It wasn't exactly as loose as if I had gone up a needle size, but it was looser than I normally am on US 1's (2.25mm). Finally, experimenting with these while I was dealing with arm issues probably wasn't the smartest thing I could have done, so I might hold on to them and give them another chance at some point. 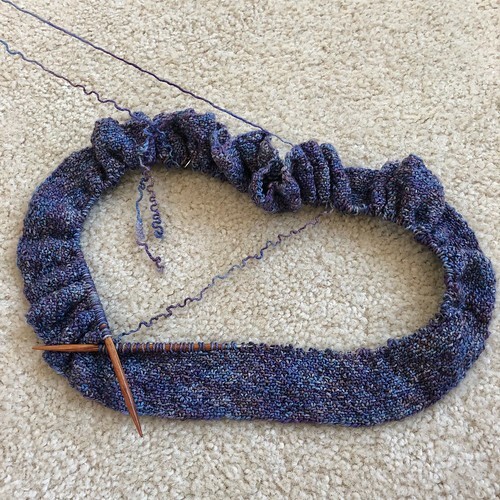 I know a lot of people just love these, but I also know I'm not the only one who isn't finding them to be a perfect fit for their knitting style. The next pair of socks will be knit on double points!